The rumor is a social and psychological phenomenon that is old in human life. All civilizations have been born. They are the birth of their society, which grows and flourishes with human needs and motivations and in the midst of life between ambiguity and importance and in the absence of certain standards of truth. It is small in its infancy, and soon the proliferator spreads its deadly weapon, which is dangerous in all its forms. As the sociology finds that scientific research is not productive unless there is a problem and its components and solutions are solved, given the current situation we are living in Iraq today, it was necessary to study the crime of news and false rumors and its impact from different aspects, including legal, it spent a weapon of psychological warfare Almost obliterates the morale of the people because of the lies and fabrications that aim to paralyze the army and the people from confronting this war of aggression so it was logical that the criminal legislator intervene in any society and the Iraqi to protect his society from the impact of news and rumors and fight it as a phenomenon that is very dangerous to The security and safety of society and national security and national interest, therefore, the Iraqi legislator punished this crime under the title of crimes harmful to the public interest. We will not be exposed to all crimes of course, but we will focus only on the crime of news and false rumors as this study aims to identify the crime of news and false rumors in the Iraqi legislation, and the French and Egyptian comparative legislation. 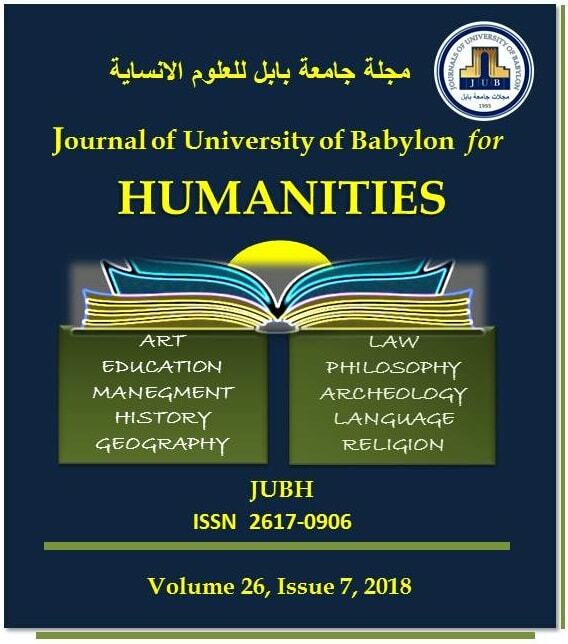 H. Hijij and H. Hamza, “Broadcast Crime News and False Rumors (A comparative study)”, JUBH, vol. 26, no. 7, pp. 243 - 295, Jul. 2018.